Hello all. Welcome to a new monthly feature we'll be running here at LitReactor, the Tech and Product Round-Up. You've likely seen tech and product reviews appear on the site in the past, and we'll certainly continue to run those, but this compilation of mini-reviews, writer-related tech news, and announcements will fill in the gaps of the individual reviews, covering the goings-on in writerly products—as well as any tips and tricks—that don't necessitate an entire 1000+ word review. You've probably heard by now that Amazon will be releasing a brand-new Kindle, especially if you've been keeping up with LitReactor's news section. Peter Derk reported on the leaked specs of the Kindle Oasis back in April. We learned there that the device sported a 300 PPI screen, a body about 27% lighter than the previous model (the Voyager), that it was designed with better, ergonomically-friendly one-handed reading in mind, and that the battery would last a whopping 20 months before needing a charge. Since then we've learned several new details about the Oasis, specifically its release date—July 17th—and its cost—$289 and some change. The price may seem steep, but consider that this Kindle sports a new front-lit feature that (unlike backlit tablets) causes less strain on the eyes. I haven't had direct experience with this function, so time will tell if users feel less ocular burdens while using the Oasis. As with previous Kindles (Paperwhite and Voyager), Oasis comes in either WiFi only or WiFi + 3G models, though even the cellular-equipped iterations manage to be thinner than its predecessors. Lamentably, despite the rumors, the Oasis is not waterproof. Amazon also announced several new features for its revamped baseline Kindle model, including a body overall 11% thinner and 16% lighter than its predecessors. Physically, this is just about the only difference between Kindle and Kindle Oasis, and while you don't get the front-lit screen, the models do share a number of new software features. The most exciting of these is VoiceView, which our very own Raine Winters reported on back in May 2016. 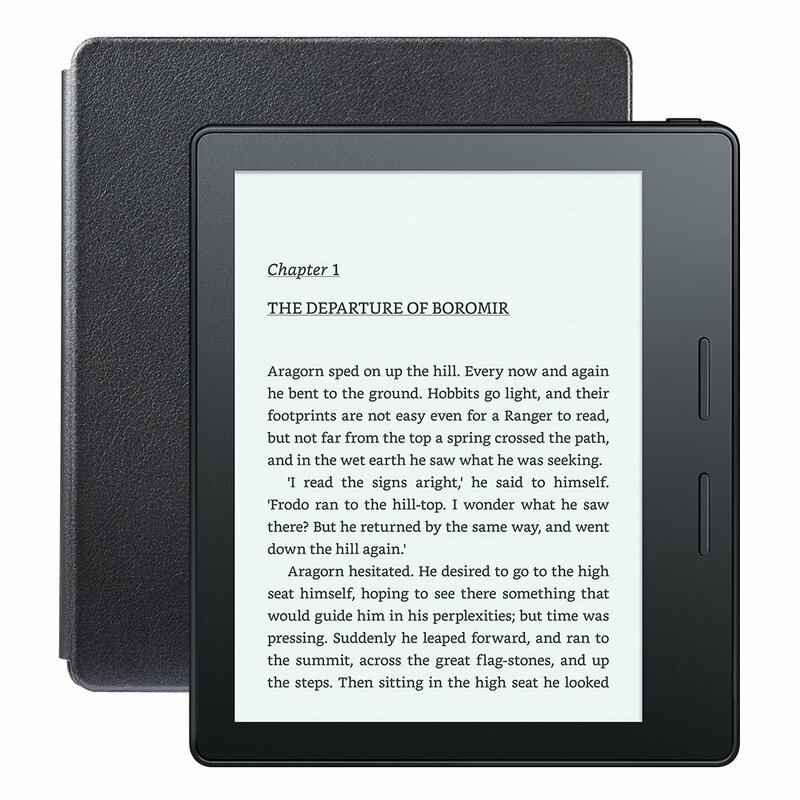 It allows visually impaired readers, via a Kindle audio adapter, to effectively let the Kindle read books to them. 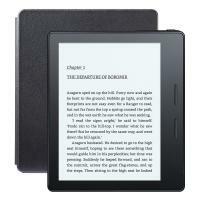 The new entry-level Kindle is available now and it runs for $79.99. If you're bemoaning the fact that you read all your Kindle books on an iPad or other Apple device, and you'd also like the ability to have your tablet read to you, fear not! 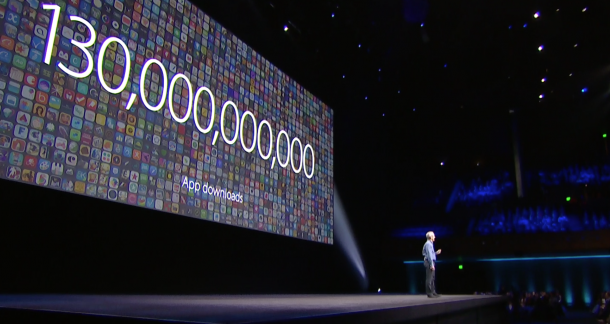 There's an accessibility feature built in to all Apple devices that will allow you do this. 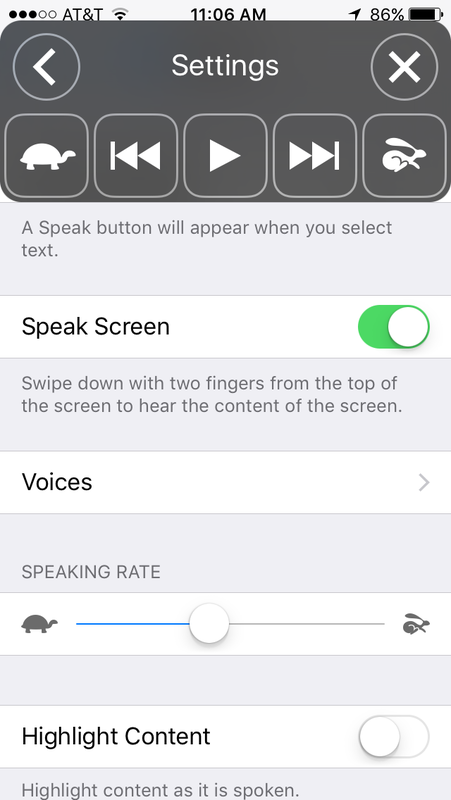 Go to Settings > General > Accessibility > Speech, and turn on Speak Screen. 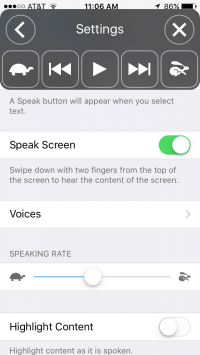 From there you can also select which type of voice you'd like (Siri is the default), how fast you'd like the robot to read, and a few other nuances you can customize to your liking. Once this function is activated, just swipe from the top of the screen to the bottom with two fingers, and you'll see what looks like an audio player box appear. This allows you to start and stop the narration, as well as exit out of the function if you so choose. 1. Siri (or the voice of your choosing) will literally read ANYTHING on the screen, which includes Kindle books. But even better, if she's reading an eBook to you, she'll automatically turn the pages as she reads, meaning you don't constantly have to fiddle with the device to keep the narration going. 2. It isn't just great for the visually-impaired. If you are, say, WAY behind on your reading of a book you're supposed to review for a lit-based website you work for, but you also have to take a long road trip by yourself, you can simply let Siri read the book to you (I wouldn't know a thing about this first-hand). Or if you just dig listening to audiobooks, but you don't want to pay for additional audio versions of your books, or for a monthly audiobook service like Audible. Yeah, Siri doesn't always pronounce everything correctly, but overall she does a pretty good job of bringing the text to life, so it's a wonderful poor man's answer to the schmancier iterations read by actors and authors. Exactly what it sounds like. Copy text from your iPad, for example, and it's available in the Clipboard on your Mac. 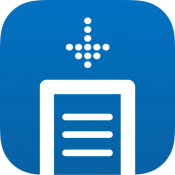 Insert any other device pairings you can think of, the clipboards are universal. So if you've got a bit of text on your phone that you want to insert into the manuscript you're writing on your iPad, you no longer have to transcribe it manually. Personal example: I've got a voicemail on my phone from a wrong number. The details of this message aren't important, but I want to use aspects of it in a story someday. Whenever I do get around to doing this, I can now use the voicemail transcription function—which will render the audio recording into text—to transcribe the recording for me, saving me time and energy. This isn't a wildly revolutionary notion, but you'll be able to share notes in the Notes app between people now. Yeah, you can already do this on Evernote—and it's par for Apple's course to lift concepts from other developers and pretend they came up with it first—but even still, I personally find Evernote to be a bit clunky, so I've always used the default Notes instead. Why is this good for writers? Well, if you're working on a project with a writing partner, you'll now be able to easily share and maintain a database of thoughts and ideas in one place. Yeah, like I said, this isn't groundbreaking stuff, but it's worth mentioning. For those awaiting the day their iPad can truly top the laptop as their primary computing device (and I'm one of those), this feature brings you one small step closer to that reality. You can now have *gasp* two Safari windows open at the same time, with the ability to temporarily use a third app—like, say, Notes, Pages, or Microsoft Word—while also viewing those browser pages. So if you're culling information from multiple online sources whilst writing, this feature will surely save you some time (again, assuming you're not using a MacBook or any other laptop, which can already do that and a whole lot more). Speaking of Apple and Kindle: have you ever wished there was a way to send an article from your Safari browser to the Kindle app directly? If you're saying you can already do that, you're right, to a degree. There are plenty of apps that will automatically export any web page into a PDF, that you can then open in Kindle (or iBooks, or your eReading app of choice). But what of the proprietary Kindle format, AZW...or is it MOBI these days? I think both work. Whatever it is, is there a way to send web content directly to your Kindle app, in the proper format? (Because let's face it, as far as reading books go, PDF stands for Painfully Dreadful Fuckery.) The answer is, YES! It's called Ascend. You download the app, link it with your Amazon Kindle account, and you're done. The app now shows up in the share menu as Send to Kindle. Tap that, and Ascend will send the article to Kindle. It's as simple as that. Why would you want this? Namely, if you're wanting to reference the article in anyway—be if for a journalistic piece or for fiction—Kindle makes it so much easier to highlight text and take notes, as well as read the text in a format that you've no doubt already customized to your liking (font size, text spacing, etc.). Plus, utilizing Ascend basically makes an archive of articles, so if you are using it as a reference point for another project you're working on, it's a quick and dirty way to save that article for later reading that you can access from your computer. Pretty neat, huh? Download Ascend here for iOS. For Android users, there's a similar app called, aptly, Send to Kindle (not to be confused with Amazon's own computer app of the same name). I don't have direct experience with this one, but the reviews on Google Play seem to be good. It's free, so check it out and let us know in the comments section if it's worthwhile. That's all for this month. I'll be back in August with more of the same tech and product information. If there's something you think LitReactor should cover, mention it in the comments section, or send an email to tech@litreactor.com and I'll check out. Since I'm in the market for a new eReader, I will be looking at the Kindle Oasis vs the iPad Pro. I wonder how the true tone vs the front lit system compare with each other. There is also the price tag to consider. But with Apple's split screen, I can read an article and write about it without flipping between the two. This is a huge benefit for me because I have a horrible memory. Things to consider. Thanks for the article. I look forward to the monthly updates. Thanks Jose. If you're wanting to use your tablet as both an eReader and writing device, the iPad Pro would be the way to go. Or possibly look into a Kindle Fire, which would allow you to use a Bluetooth keyboard. Though of course, as you say, the split-screen functionality is definitely a bonus.